It's two dispensers in one! Save allot of time with the TD5000 tape dispenser! 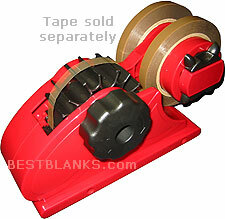 This is a manual definite length tape dispenser, perfect for applications where a fixed length of tape is needed. Perfect for high production of sublimation drink wear, tiles, etc. 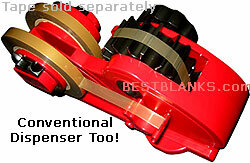 A proven time and labor saver! 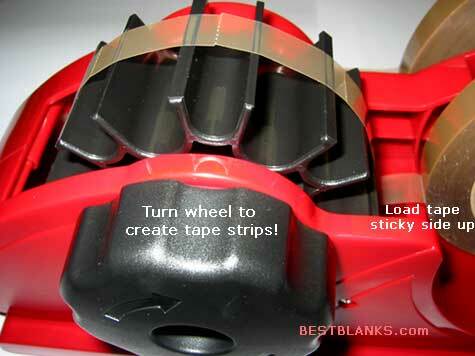 With one turn of the big wheel the unit covers the sprockets with 4 strips of 1.5" tape strips. The second build in roll holder (on the left side) works like a conventional tape dispenser. Max Width of Tape: 1"